As we enter a new year, the Great Bear Foundation would like to wish all of our supporters a year of health and happiness. Right now, across North America, polar bears are hunting ringed seals on the ice, grizzly and black bears are enjoying their winter sleep, and female polar bears are in their dens, starting to give birth to cubs. Soon, they’ll be followed by the births of grizzly and black bear cubs. GBF is looking forward to a busy year. We’ll be giving Bear Basics programs in local schools, working with residents to find solutions to bear attractants in their yards and neighborhoods, leading guided walks in bear habitat, and teaching polar bear ecology field courses on Hudson Bay. Meanwhile, we’ll also be weighing in on public policy issues that affect bears and their habitats, promoting low-impact, ethical wildlife-tourism, and keeping the public informed on the latest news in bear biology and conservation through our website, social media, and our publication, Bear News. We’re still hard at work on our documentary film on GBF President, Charles Jonkel, and we hope to get that out by the end of this year. Check back with us in the coming months for updates on the film. We hope you’ll join us this year on one of our field courses, attend our talks locally, come to Bear Honoring in May, or volunteer with our Bears and Apples program. Whatever you do this year, please be sure to secure the bear attractants, like garbage, animal feed, fruit trees and birdfeeders around your home, slow down to avoid hitting wildlife on the road, and, if you venture into bear habitat, please learn to recognize bear sign, be alert, learn about bear behavior, and carry bear spray where it is easily accessible, and know how to use it. 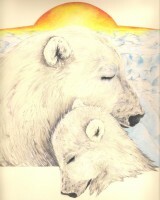 The Great Bear Foundation wishes you and your loved ones a happy, healthy, and safe 2012.